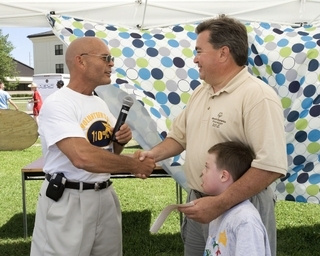 PASCAGOULA, Miss., May 26, 2009 (GLOBE NEWSWIRE) -- More than 60 Northrop Grumman (NYSE:NOC) employees volunteered for the 2009 Special Olympics Mississippi Summer Games held May 15-17 at Keesler Air Force Base in Biloxi. On Saturday, Irwin F. Edenzon, vice president and general manager of Shipbuilding Gulf Coast presented a $5,000 check to Denton Gibbes, chairman of the Special Olympics Mississippi board of directors. "You can count on our continued support of Special Olympics," said Edenzon, who was named to the Special Olympics Mississippi board of directors in April. "Special Olympics provides outstanding opportunities for success for very talented individuals and highlights the strengths of not only the athletes but of their families as well." Summer Games featured more than a dozen events for Special Olympians, including track, golf, volleyball, tennis, sailing, and high jump. Hundreds of Special Olympians and volunteers congregated in an Olympic Village that offered food, drinks, fun and music. Northrop Grumman volunteers staffed many of the booths in Olympic Village, such as the water balloon toss, golf putt and milk bottle toss, and handed out prizes to Special Olympians. "We are so very grateful to Northrop Grumman Shipbuilding for their financial and hands-on support of Special Olympics Mississippi," said Denton Gibbes, president of Special Olympics of Mississippi. "This is truly a special relationship between the state's largest employer and an organization dedicated to providing acceptance and competitive opportunities for fellow residents with intellectual disabilities." Jennifer Oglesby, a financial analyst at the company's Avondale facility, was one of the volunteers. "I wanted to help by volunteering because when I was little, I went to Special Olympics with my brother, who is autistic," she explained. "I just wanted to give back." David Cunningham, director of paint for Shipbuilding Gulf Coast, said, "I volunteered because I want to help a good cause and to have fun with the kids." Arthur Pitts, Shipbuilding Gulf Coast director of joiner/insulation and sheet metal, added, "It's a great cause and I love being with the kids. It's a nice family atmosphere. It's great to see the smiles on the kids' faces." Through year-round sports training and competitions, Special Olympics Mississippi empowers some 13,000 children and adults who have intellectual disabilities to participate in their communities and develop confidence in themselves. The success of Special Olympics Mississippi is dependent upon people who are willing to give of themselves, individuals who participate not for personal gain, but for the well being of the community.